Ask most Americans who the second President of their country was and you’ll likely get a blank stare in return. That’s why Joseph Benavidez (Pictured) is looking to become the UFC flyweight division’s George Washington. While Benavidez isn’t interested in having his face plastered across any currency, he is seeking to have his name etched in Octagon lore by becoming the organization’s first 125-pound king. 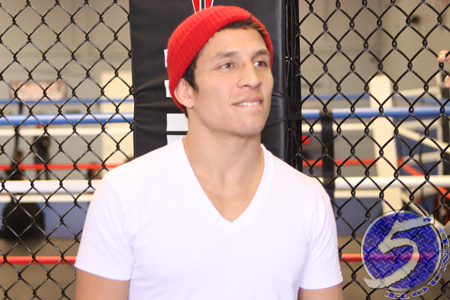 “I want to be the first UFC flyweight champion so bad I can taste it,” Benavidez stated. “Everyone remembers No. 1, everyone remembers George Washington was the first President. I want to be remembered in 20, 30, 80 years. Speaking of fantasies, Benavidez has always dreamed of donning UFC gold around his waist. Unfortunately for the 28-year-old, the planet’s premier mixed martial arts promotion didn’t initially offer his natural weight class and he was forced to compete against bigger athletes at bantamweight. Now that the flyweight division has become a reality, Benavidez believes he’s been granted a new lease on life. “The creation of the UFC 125lbs division changed my career,” Benavidez admitted. “I kept hearing it was coming, but I sort of stopped believing it would ever happen. When they told me I was going to be in a four-man tournament for the new UFC 125lbs title, it was like my career started [over] again. Benavidez and Demetrious Johnson battle to become the inaugural flyweight champion at UFC 152. As a wise man once said, “Second place is the first loser.” Or was that just written on a No Fear t-shirt back in ’94?